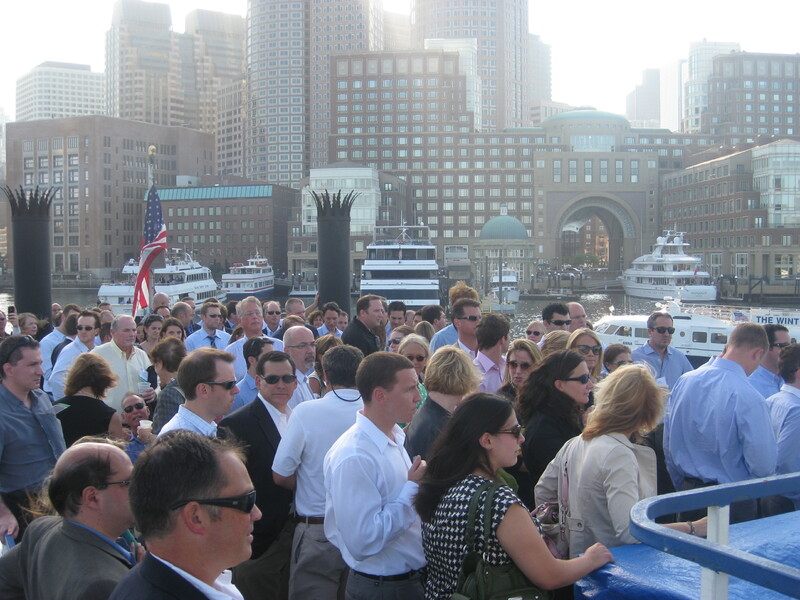 On August 17th, NAIOP had its first “Boston by Sea” Harbor Cruise along the waterfront, featuring commentary by Barry Hynes of FHO Partners, Lowell Richards of MassPort, and Kairos Shen of the BRA. Besides the unique view of the many waterfront development projects, what stood out for me was the extreme difficulty of permitting and building projects on the water, as exemplified by the many projects that have failed financially, in some cases bankrupting the developers. For all its benefits (views, access, etc. ), waterfront development has plenty of obstacles and costly surprises for those who want to build. There is the Chapter 91 law that regulates most of the city’s coastal areas, the Municipal Harbor Planning process, Boston’s Article 80 permitting process, input and review from neighborhood Impact Advisory Groups, pier piling replacement, and, frequently, costly hazardous waste issues. To top that off, there is the developer’s dilemma of timing the project to match market demand. With all of the uncertainty associated with getting a project financed and approved in a timely manner, it is difficult to know in advance if there will be the necessary demand for the completed product at a price that will justify the costs. That can result in prime development locations lying fallow. During our waterfront tour, we saw a number of development sites in East Boston that have still not started, even though they were planned for construction 5-10 years ago. Portside at Pier One, New Street, Clippership Wharf, and Hodge Boiler Works have languished for years. Most were fully permitted. However, there is talk that Portside at Pier One, proposed by Roseland Property Company, may begin a first phase. Many properties have changed hands numerous times before being developed. Prime examples are Fan Pier and the former McCourt assemblage, both having remained primarily parking lots for three decades until the current owners purchased the land. Clearly there have also been several successful projects. Without question, Rowes Wharf stands out as one of the premier mixed use development projects in all of Boston. It also looks like the “tide has turned” for Boston’s Seaport/Innovation Zone, which has many development projects underway. With one office building up, Joe Fallon and Cornerstone are now starting construction on two more buildings for Vertex. A hotel is in the works for Pier 4 with New England Development, and an adjacent apartment project is being proposed by Hanover. Despite the uncertainties in the financial markets, the Seaport area seems to have found the necessary momentum to attract businesses, residents, shoppers, and tourists. If the developers and the city can keep up the pace, soon the Seaport will no longer evoke memories of failed developments and abandoned plans. Instead, it can stand as an example of what can be achieved with vision and persistence. This entry was posted in Land Use & Development, Local News, NAIOP News and Events, Owners & Developers and tagged NAIOP Boston by Sea Harbor Cruise, Windows on the Waterfront by Tamara Small. Bookmark the permalink.